In this article, it is discussed what to do when an offline OST file stop giving response and shows errors. Microsoft OST file is very useful for every organization because this only gives the permission to users to access data in downtime of Microsoft Exchange Server but sometimes due to errors the file gets corrupt and damage for the user. In this situation users can make utilization of OST Recovery Utility that gives a very easy procedure to repair OST file and recover all OST items such as- emails, contacts, notes, inbox items, outbox items and appointments. The main motivation is to get users out of the corruption issues and during making the software, Perfect Data Solutions team worked hard and the consequence is in front of you “OST Recovery Tool” which helps to remove entire OST file errors and convert OST into several formats. The utilization of the OST to PST Recovery Tool is a piece of cake for users who need to download the software by following simple steps and successful installation of the software get start the recovery process of OST file to PST file. Download the OST Recovery Tool Software on your machine. Run the downloaded setup by following the instruction. Now browse your corrupted .ost file by two ways “Browse” or “Auto Search” both methods are used to find out the location of OST file. The scanning process has been started and the software will keep all the folders or emails in front of you that you can preview by opening the email’s body. Recover emails by two types; Either select the emails or folders using check box button or select the complete OST file. Just save your OST emails into different formats such as- EML, MSG, HTML, MHTML, RTF, TXT, DOC, PDF, PST, MBOX and Outlook Profile. While converting OST as PST; if you want to make small PST file, then you can define the size from 1 GB to 5 GB to get PST File split. You can use “Messages filtering option” and “Multiple convention” option to restore the OST file. OST Recovery Tool Software assistances to recover emails from inaccessible OST file in additional to Convert OST file to PST File with email properties- to, bcc, cc, time, subjects, from, email header information and embedded images etc. The messages filtering option is world best which saves users time and allows users to filter the emails according to dates “From date” to “To date” to recover OST file to PST file without creating any problem. You can get the complete preview OST file to PST Outlook file with complete its stuff. OST to PST Recovery Software is used for OST File Recovery into Existing Outlook profile and PST file that having the facility of PST file splitting up to 5GB. It also gives the option to recover those emails which having attachments. Outlook OST file Recovery Software helps to recover data from OST file to PST. Nice article.. I have an amazing experience to use Kernel for OST to PST converter tool. It has recovered my entire OST file from its bad state and move them to PST file format easily. 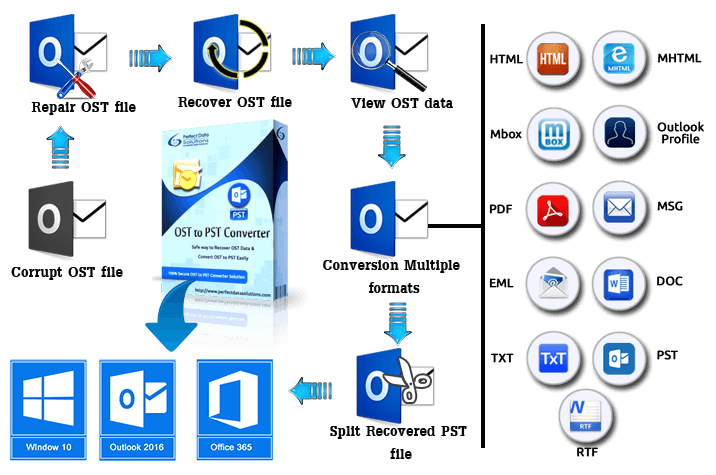 OST to PST converter software recovers corrupted ost file and you can export to pst file, office 365 and Live Exchange Server. -Conversion of emails, contacts, notes, calendars, Tasks, Journals and Etc. Download prominent OST file exporter tool for wonderful and proper recovery of OST files and their conversion to PST formats. By using the tool, users are free to export OST files to PST format without any hurdles. No data loss will be faced by users.